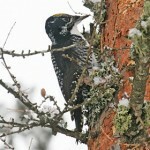 Description: Male has black head, breast, and back; two white facial stripes; red throat; large white wing and rump patches; and yellow belly bordered by black-and-white barred flanks. 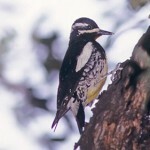 Female is strikingly different, with a brown head; brown-and-white barring on the back, wings, and flanks; black bib; and small yellow area on belly. Female does show a large white rump patch, but lacks the white wing patches and red chin. Habitat: Usually found in dry, ponderosa pine and open coniferous forests. Where in Nebraska: Casual spring visitor. One sight record in Adams County, 1939; Douglas County, 1988; and Hall County, 1959. 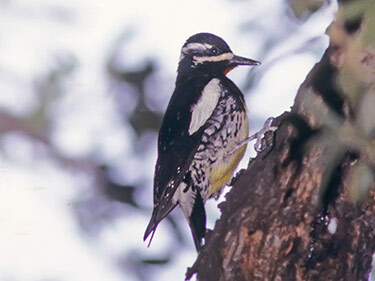 Field Notes: During the winter these birds either migrate south or move to lower elevations. 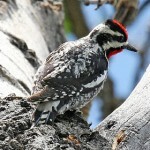 Fun Facts: The female and male Williamson’s Sapsucker look so different that until 1873 they were thought to be separate species.